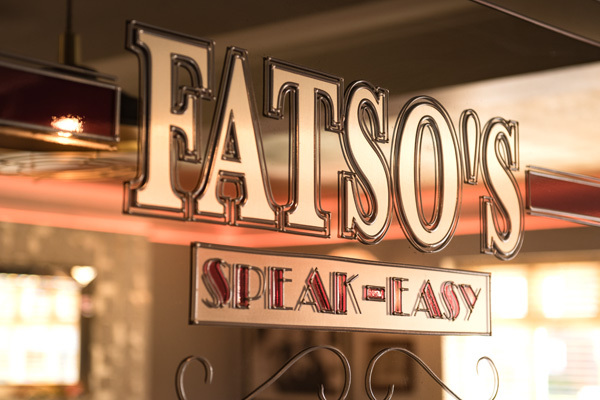 For the complete 1920-1930's American experience dine at Fatso’s. 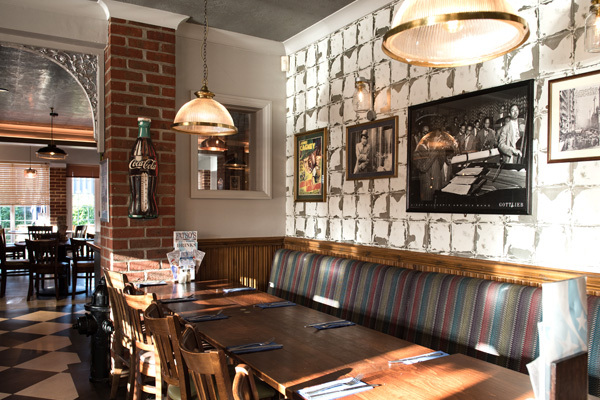 Whether you require a simple snack, dinner for two or have a festive occasion to celebrate, we provide a variety of choice within our menus to cater for your every need. Toasted ciabatta brushed with garlic butter. Toasted ciabatta brushed with garlic butter, and topped with mozzarella cheese. Potato skins filled with bacon and cheese or pulled pork or chilli served with sour cream and salsa dips. Breaded juicy mushrooms served with a garlic mayonnaise dip. 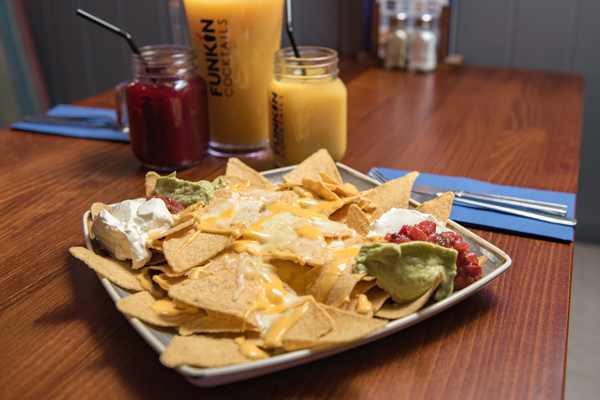 Crunchy corn tortillas topped with trio of cheeses: - mozzarella, red cheddar, and a silky, creamy, smooth cheese sauce. Served with salsa, creamy guacamole and sour cream. Chicken wings tossed in your choice of Hot Louisiana sauce, barbecue sauce or Tennessee sweet and smokie glaze or hot. 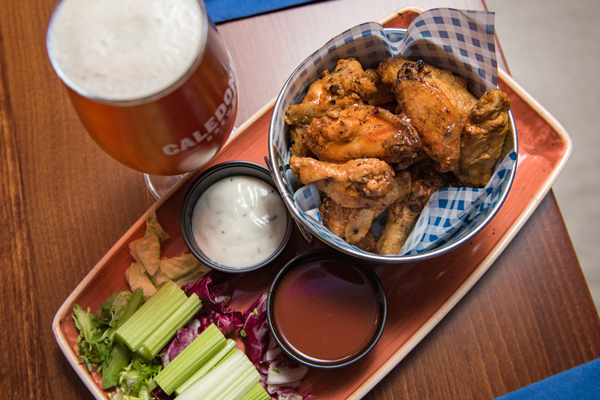 Served with celery sticks and a blue cheese dip. Breaded tender chicken breast strips, served with Mama’s sweet and smokie barbecue dip. Crisp fried potato skins, breaded mozzarella sticks, beer battered onion rings, crispy chicken strips, cheesy nachos, garlic bread and a selection of dips. Double stacked burger topped with bacon, melted cheese, barbecue sauce and battered onion rings. 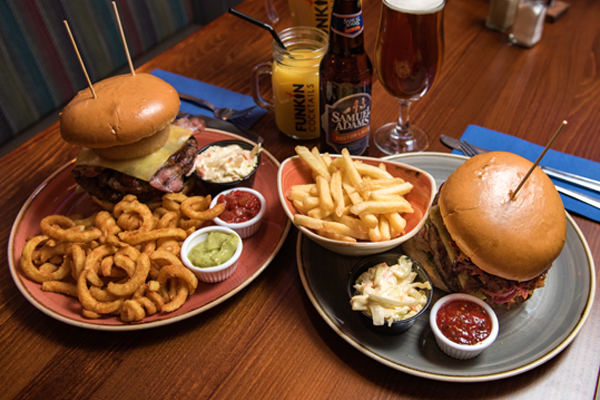 Choose either Southern fried chicken breast or hot wings and half rack of baby back ribs served with a mini cob. 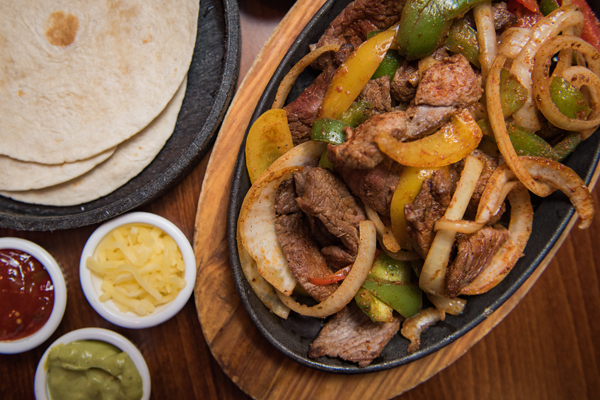 A sizzling skillet based with onions and peppers served with guacamole, salsa, sour cream, cheese and warm flour tortillas to “wrap it up”. 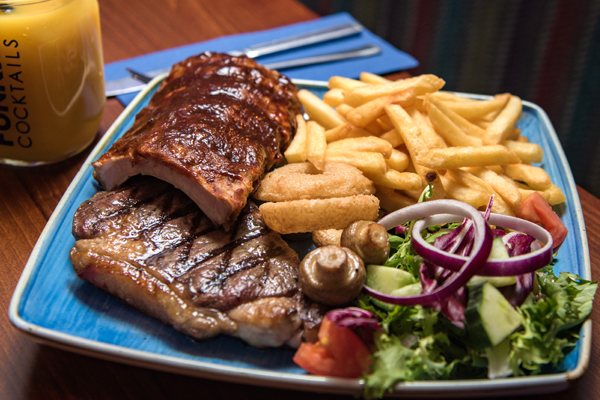 Tender chicken baked in hot ‘n’ spicy piri-piri sauce and half rack of baby back ribs smothered in Mama’s sweet ‘n’ smokie barbecue sauce and served with a mini cob. 8oz succulent steak with a hearty flavour. Topped with bacon bits and drizzled with a silky, creamy, smooth cheese sauce. 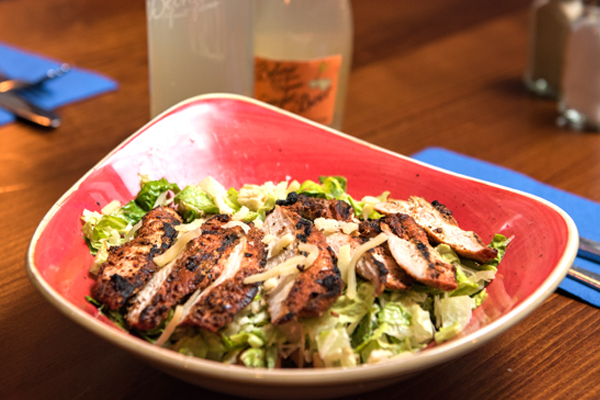 A full breast of sliced grilled Cajun chicken served with Romaine lettuce tossed in caesar dressing with shaved parmesan and croutons. Jalapeño shrimp, whole tail scampi and Atlantic prawns served with dressed salad garnish, homemade coleslaw and your choice of potatoes. 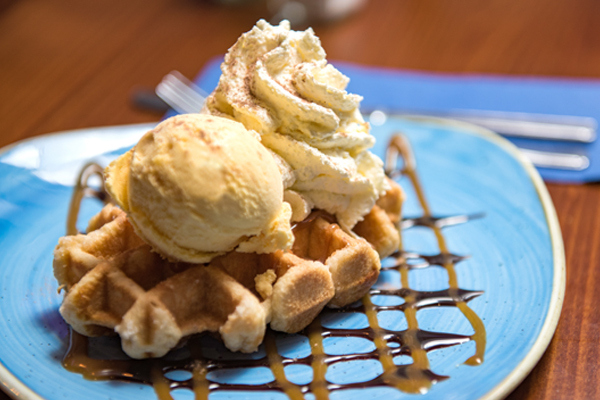 A chocolate coated waffle with honeycomb and vanilla ice cream, chocolate honeycomb pieces, whipped real double cream, caramel & chocolate sauce. 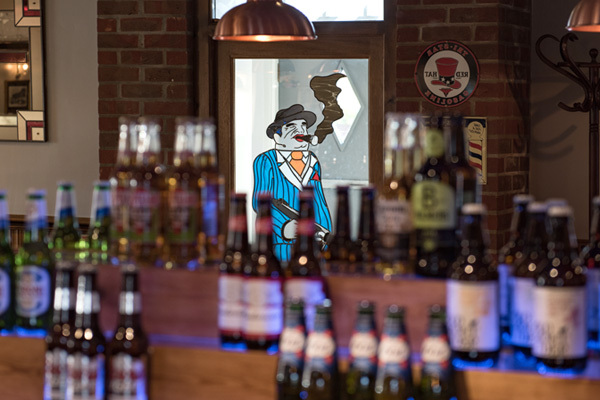 The Party is at Fatso's! 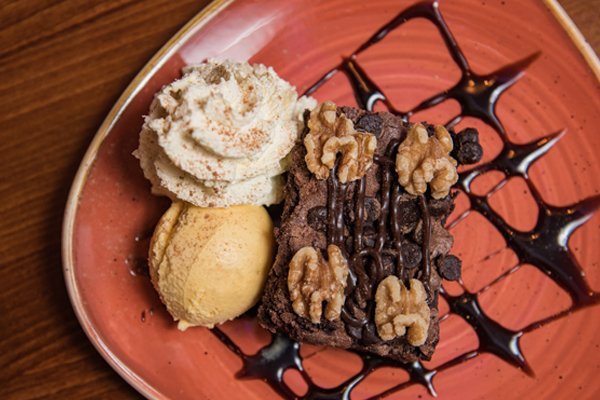 Here our some pictures of our mouth watering food to get you through until you next see us. Browse upon our succulent selection and we will see you soon.